24-203-BLK color: Black Features: -Constructed of quilted-nylon. 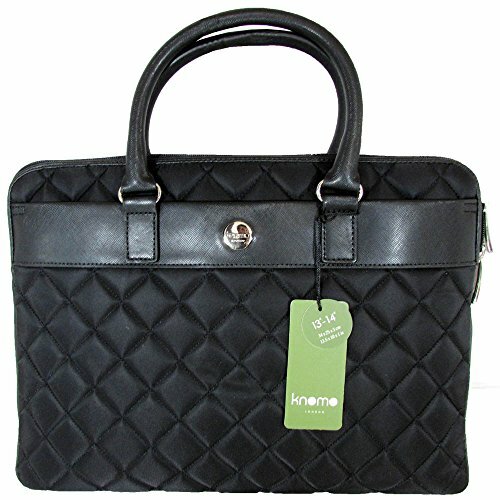 -Trimmed in black textured-material, detailed with nickel-colored hardware. -Front and back slide pockets. -Detachable adjustable shoulder strap in webbed-nylon. -Eggplant-colored lining with soft "peach" hand-feel. -Signature front Knomo pocket with zip closure and small slider-pouch. -Built-in padded laptop-sleeve protects a 13" computer. -Dimensions: 10" H x 14" W x 1.25" D.
If you have any questions about this product by Knomo, contact us by completing and submitting the form below. If you are looking for a specif part number, please include it with your message.